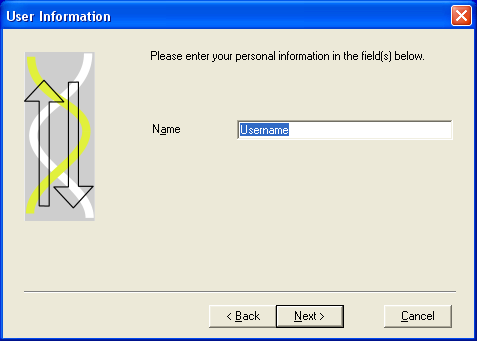 In the "User" section of the configuration window, you can change your username if you wish (or leave it blank to be anonymous). If you want to join The DVF Grim Ripper team, enter the team's number here (circled in red in the sceenshot, team number 51205). '''Core Priority''': This setting allows you to specify the running priority of Folding@Home. The default "Lowest possible" is recommended, as this will set Folding@Home to only run when other programs (who will have a "normal" priority) are not running. You can use the "Slightly Higher" option if you have other similar applications running already. 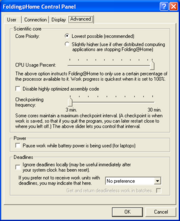 '''CPU Usage Percentage''': If you never want Folding@Home to use more than X% of your CPU, you can set it here (anything less than 100% is not recommended, as you might waste precious CPU cycles ... if you don't want Folding@Home to interfere with other programs, use the "Lowest possible" priority setting above. '''Checkpointing frequency''': I like to set this to the minimum possible, 3 minutes. A checkpoint is when the work that is performed by Folding@Home is saved ... setting it to a lower timeframe will allow you to exit Folding@Home (manually, or through a system reboot) without losing too much of your work (only 3 minutes worth at most). Press "OK" to save your settings, and Folding@Home will start to work in the background. You can exit Folding@Home anytime by right clicking on the tray icon and selecting Quit. You can double click on the tray icon to check your current work unit progress, and see a 3D representation of the protein folding that is taking place. This short guide shows you how to install the GUI (Graphical) version of Folding@Home, and to set it up so you can joing The DVF Grim Rippers Folding Team. Go to the official Folding@Home download page and download the Windows 2000/XP/Vista or 98/Me Graphical client installer. Run the installer and proceed with the installation. When you get to the following screen, type in the username you wish to use on the Folding@Home network (or you can make it blank to be anonymous). Continue with the installation until it has been completed, and a Start Menu folder has been created for you. By default, the Folding@Home installer will put a shortcut to the Folding@Home GUI client in your "Startup" Start menu folder, to launch the application automatically upon start up. You can keep this shortcut there, or delete it if you wish to launch Folding@Home manually. Locate the Folding@Home folder in your Start Menu, and start the Folding@Home client. The client will place a tray icon, and you can right click on this tray icon to see the client options. Right click on the tray icon and select "Configure". Core Priority: This setting allows you to specify the running priority of Folding@Home. The default "Lowest possible" is recommended, as this will set Folding@Home to only run when other programs (who will have a "normal" priority) are not running. You can use the "Slightly Higher" option if you have other similar applications running already. CPU Usage Percentage: If you never want Folding@Home to use more than X% of your CPU, you can set it here (anything less than 100% is not recommended, as you might waste precious CPU cycles ... if you don't want Folding@Home to interfere with other programs, use the "Lowest possible" priority setting above. Checkpointing frequency: I like to set this to the minimum possible, 3 minutes. A checkpoint is when the work that is performed by Folding@Home is saved ... setting it to a lower timeframe will allow you to exit Folding@Home (manually, or through a system reboot) without losing too much of your work (only 3 minutes worth at most).